Having children shakes up your life. Beyond the great identity-shifting that is new parenthood, a more gradual adjustment occurs in the scenery of life: the food we eat, the hours we keep, the music we listen to. As my children grow from newborn to infant to toddler and beyond, as they develop their own schedules and personalities and likes and dislikes, the changes in the details grow more pronounced. The days of cooking complicated meals and eating at 7:00 are gone; now it’s mac and cheese with steamed veggies at 5:30. The soundtrack of the day is no longer whatever Songza playlist strikes my fancy; it’s something decidedly more… juvenile. And despite my best efforts to maintain a semblance of adult cool,* I find myself taking on the hobbies and interests of my toddler, however unlikely. If you’ve got a kid who loves trucks, if you’re okay with signing away your right to ever listen to any other kind of music again, and you’re prepared for an endless earworm, then by all means, check out these videos. You’re welcome. Also, I’m sorry. I can’t remember how we first found the videos. Maybe it was magic. Maybe they found us. But once Bean had seen them, they could not be unseen. Or unheard. Bean LOVES these things. As I’ve written before, we do limit his screen time, but sometimes I just need to let him space out for a bit so I can regain my sanity. The “twuck bidowoes” are a frequent request. He would watch them all day if he could. My husband is convinced there’s some kind of subliminal message embedded in the songs that makes toddlers want to watch them again and again, but seriously, what would that be? What is more attractive to Bean than the videos themselves? They are about TRUCKS! If I’m being honest, part of the appeal of these videos is that they help me to disguise my lazy mum screen time shame. When Bean is spending too much time zoned out in front of shows, it’s obvious in his conversation and his play. “You know Mr. Gronkel?” Busytown Mysteries. “When you see a baby, say baby!” Go Diego Go. ** But if he’s talking about crane trucks, or excavators, or dump trucks – well, clearly that’s just something he knows. You know, from books. And outside. But it’s a double-edged sword. Because even though I’m not the one watching the videos, I can still hear them. And then I sing them. And I can’t stop. Even when we haven’t watched them in days and days, I will find myself humming them incessantly. I’ve been thinking about these videos a lot. Like, an unhealthy amount. I just have so many questions. Who is the person singing them? Is he really as excited about trucks as he sounds? Does he have another career, or is he purely a guy who sings about trucks? Did he always want to sing about trucks, or did he have dreams of a career as a mainstream pop artist? Is he a former heavy-duty mechanic forced to retire due to a work-related injury, who is channeling his knowledge into this creative outlet to help himself get over the psychological trauma of the aforementioned injury? What kind of dark sorcery has he employed to make these godforsaken songs so freaking catchy? I can’t be the only one, right? The excavator song alone has more than 23 million views on YouTube. At least 22 million of those are not me. It is a staple in our car and played every time we turn the car on. The entire family knows all the lyrics and sometimes I feel we sing them in our sleep! He already knows two or three songs by heart, and he has only had the DVDs for a few days. This set is literally the only thing he watches EVER for going on 5 months now. He watches the videos as often as we let him & he listens to the CD EVERY day, sometimes several times/day! I can barely get his little truck t-shirt clean before he puts it on again! 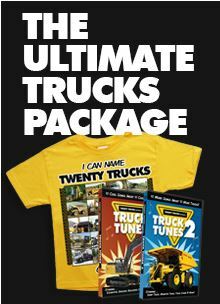 Should I order the ultimate trucks package today? I mean, I probably should, right? *Who am I kidding? I’ve never been cool.